Thursday, 1 Feb: Wow, January is over. What an amazing month for us. 1-Jan we arrived in Lanzarote and here we are already moving off from the first island in the Caribbean. Excepting the sound of disco music from both the shore and party boats cruising around Carlisle Bay, we had a surprisingly nice night at anchor. So much better than all that squeaking and jerking of mooring lines in the marina. There are probably 10-12 other yachts anchored around us. Dutch, French, German, Swedish and British. Our view over Bridgetown isn’t particularly special, but the colorfully painted warehouses are interesting. We prepare for the voyage to Grenada, about 150 miles away. If we leave midday we should be there tomorrow morning. We swing the boom out and put up the bimini. But as we tighten it there is a ripping sound. The stitching on one corner has given way :(. 2 seasons in the Mediterranean sun has rotted the thread where exposed to the sun. So it’s out with the needle and thread for a “stitch-in-time”. We’ll have to find someone to re-sew it all. Hmmm yet more cost. Then we setup the pole and all the gybe retainer lines. Oooph so many ropes on deck again …. and no Ellie to keep an eye on which should go around what! But at least the fore-deck is now clear, with the dinghy on its davits over the stern and the spinnaker banished to the fore cabin. Oana raised the anchor and we are off. But to start with we turn SE and sail the south coast to Oistins, storming along with just genoa in a gusty offshore wind. So nice to actually be sailing slightly upwind on flat water. The beaches on this side a very white, fringed with palms hiding hotels behind. At Oistins we turn SW away from Barbados, pointing towards Grenada. Soon we are sailing downwind again with twin head-sails in 15-18 knots wind, doing a steady 7.5 kts. After 30 minutes we are rolling again …. but at least it’s only for a day this time. There seems to be 2 sets of swell. We guess each one swinging in from either side of the Barbados and meeting in the middle where we are. Feels like we are sailing back to winter, dark clouds, no sign of sun since 1pm, and spots of rain. 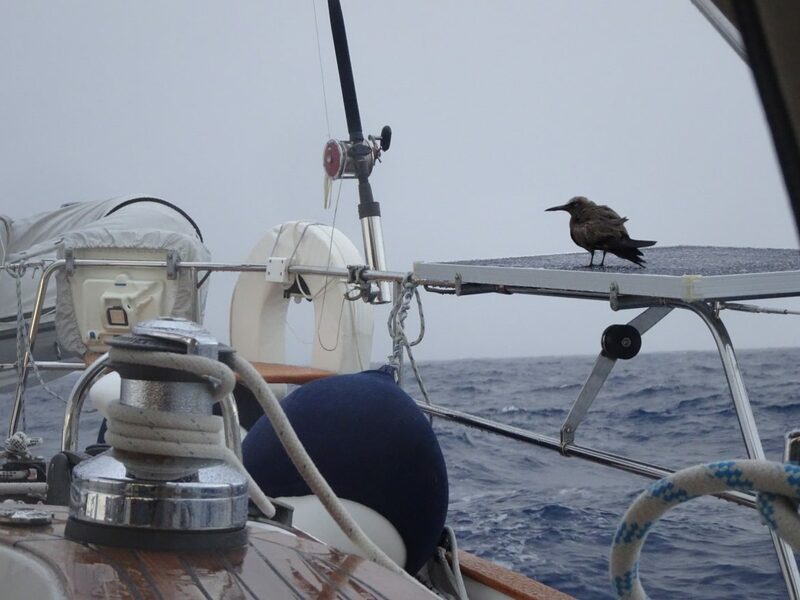 A bird lands on the solar panel to catch a ride with us. It is very funny to watch how it slides up-down when boat is rolling. As if it has had enough of being disturbed, the bird flies 1m and takes ownership of the life ring. When wind shifts, the flag disturbs this new spot, so the bird flies to the boom. Peace at last for our little passenger, who peacefully rests there for few hours. We then have 3h of very shifty low wind (8-15kts) with floppy genoa. 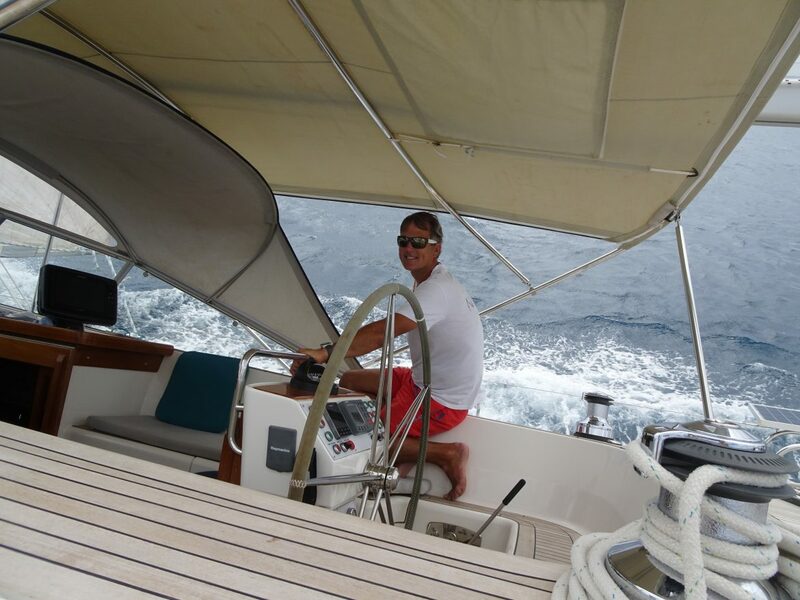 The wind finally settles and out comes the cutter again, improving our speed to 7kts. But still a horrible motion. The moon rises soon after sunset. It is not quite a full moon, but very bright. Lovely moonlight reflecting on the water and making our sails look like they are glowing. As we left Barbados a day after we told the authorities we decide to leave the AIS tuned off for a while. We are reminded that we don’t have it on yet as we see a ship passing behind us. 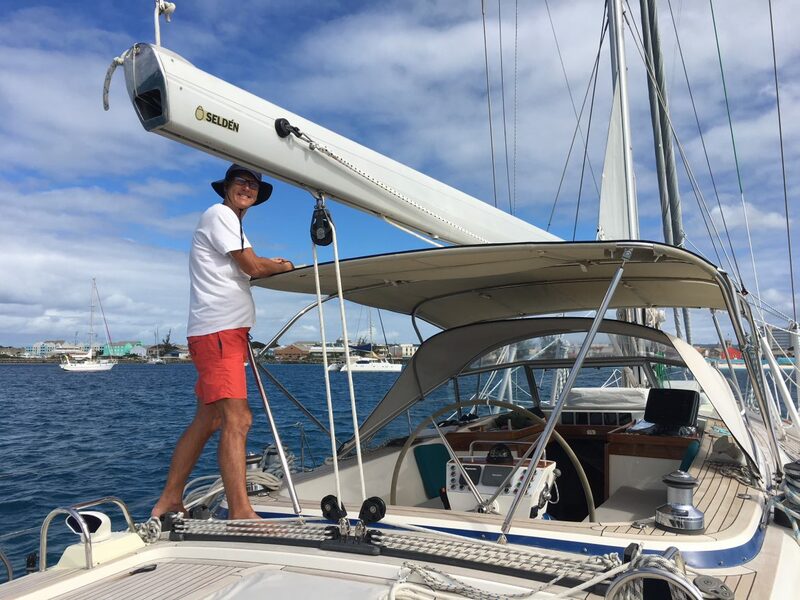 Glen switches it on and changes our AIS destination to Grenada. We then settle into a night of 3h-on, 3h-off shifts.